Electronically upgrade your game, the i5 is ready to go wireless. With the simple plug and go kit, your i5 and M2 are in instant communication, feeding you vital game time information via wireless air-sync connection. Automated audio alerts and reports keep you ahead of the competition. e.VOKE is the next evolution in paintball goggle systems and paintball gun technology. The i5 was designed to protect every player at every level of competition. More coverage without sacrificing style or weight. 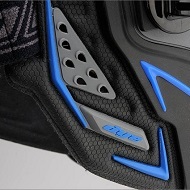 The i5 facemask provides increased protection, while still maintaining a tight profile with total comfort. The GSR Pro-Strap is a quantum leap in strap design and security. The GSR gear lock system gives you precise tension control for a secure, comfortable fit. The extra wide head pad grips the back of your head, and distributes the force over a large area, ensuring zero slip and maximum comfort. Simply turn the dial and ratchet down your i5 to a precision fit. 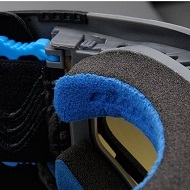 The GSR is a revolutionary step in goggle strap technology providing the ultimate in comfort and performance. Integrated mounting system for POV cameras. Play with confidence that you are capturing every moment on video. 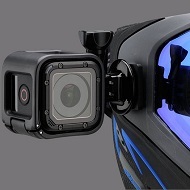 The POV mount sits parallel with your line of sight to help you attach your POV camera securely and with proper alignment so you won’t miss a second of the action. Using patented technology the i4’s precise blade angling and proven venting configuration, heat and moisture dissipates quickly. Scream multi-directional venting makes communication with teammates effortlessly by carrying your voice farther. Audio clarity. The i5 ear guards are specifically designed to prevent reduction in hearing, without leaving your ears vulnerable. Precision shaped and positioned hole patterns allow sound to flow cleanly through the ear guard, without distortion. With injection molding quality as the priority, the I5 is a anatomically correct fit with the lightest construction possible. The anatomically correct i4 mask system offers the best in comfort for all facial contours. The i4 is tested at twice the current impact astm and ce standards. Dye’s proprietary dual stage foam combines open and closed cell foam technology. Dual stage foam is specifically designed to “sheet” sweat and moisture away from your face, providing an undeniably resilient boundary between your eyes and perspiration. Comfort at a new level. DYE’s new soft touch foam offers the most comfortable facial fit in the industry. New high grade open cell multi-layer foam provides an ultra-soft touch, while simultaneously providing a rugged secure fit. Dye’s new compression foam with the luxury of a terry cloth treatment gives the i5 ultimate form-fitting comfort. Patent pending, quick, simple, tool-less foam replacement. The i5 lets you keep your mask fresh, clean, and comfortable. Never play with worn out, uncomfortable, and deteriorating foam again. In seconds you can be back to new and winning on the field. The i5 benefits from the new low profile rapid lens change system, allowing lens changes in seconds. Lens changing is as simple as pinching the retention clips, sliding them forward and the lens is free to be removed. Effortless, quick and simple. The i5 features an industry first compound radius lens with thermoformed technology, giving the player the ultimate vertical/horizontal peripheral vision. Dye thermal lenses provide the benchmark for anti-fog performance. Made famous on the Dye i4, our thermal horizontal 290 degree lenses provide perfect optical clarity and have set the standard of visual performance for others to follow. 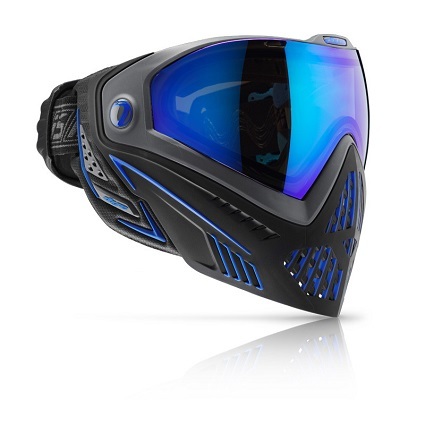 DYE’s Horizon 290 lens offer more peripheral vision than any other paintball mask system on the market today. Opposition movement is easier to recognize and provides a distinct tactical advantage. This, combined with our optically correct and robust Tiroidal design, protects your eyes with excellent optical clarity. The i5 lens is manufactured with a premium hard-coat dip, that protects both sides of the lens against scratches and minor abrasions. Additionally, Dye’s UV hard-coating offers exceptional protection from the sun’s harmful rays. The I4 and I5 utilize the same compatible lens. Ear protection is critical, but it does not need to be bulky. The i5 system features a compression formed earpiece that is soft, flexible and extremely lightweight. Constructed with advanced materials that increase moisture evaporation while providing full coverage protection and comfort. Sometimes meeting the standard isn’t good enough when it comes to safety. The i5 is tested at twice the current impact ASTM and CE standards. Compete with confidence that your safety is our #1 priority.